Using the existing slate floor as inspiration for the overall colour pallet of this renovation we designed a functional space that “works” so much better and “feels” like it belongs now. Including an under cabinet microwave and prep sink in the island creates multiple work zones for when there is more than one cook in the kitchen. The raised eating bar provides additional seating and is a great serving area when entertaining buffet style. 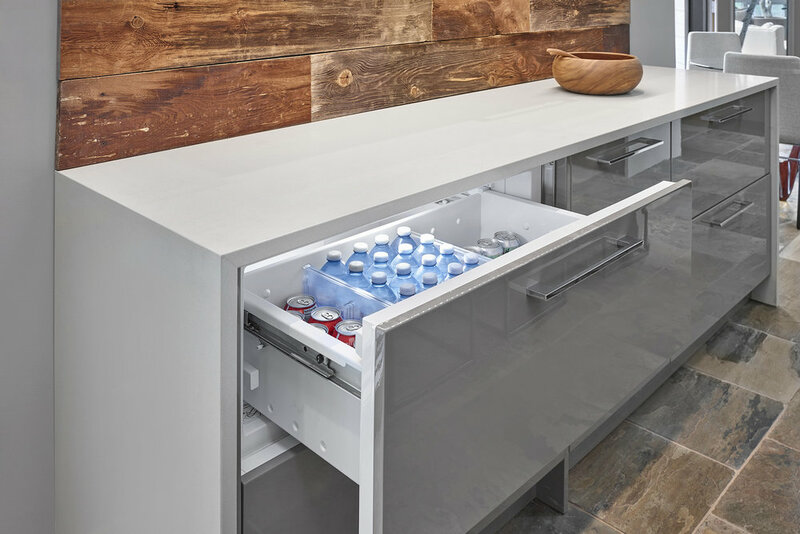 Horizontal lift doors, pantry roll-outs, tray dividers, double waste bin, whitewashed cabinet interiors and stainless drawer boxes are just a few of the hidden treasures of this kitchen. For convenience a fridge drawer was installed in the bar area. It's so rewarding when a client continues to show confidence in me and our team. These homeowners allowed me to design this renovated kitchen then their business office cabinetry & desk and then do a bathroom renovation. I'll be seeing this fun couple again to renovate another bathroom... it feels like I've known them forever.